Transit and regional transportation is improving in our region. Much of this is thanks to the federal government’s renewed interest in funding public transit. In 2015, things were looking bleak for transit expansion in our region. The federal government provided ad-hoc funding for cherry-picked transit projects, and would only pay up to 33% of project costs. The provincial government was committed to paying for 33% of the cost of transit projects. The regional had to pick up the tab for the remaining 33% of project costs, plus the on-going operating costs of running an expanded transit system. Map of regional transportation investments. 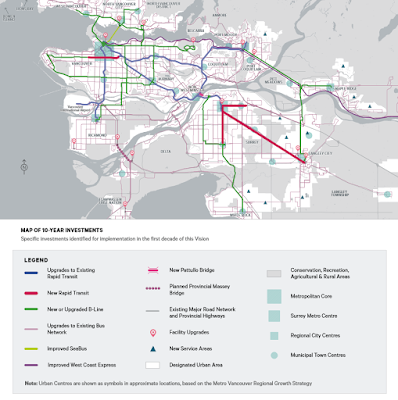 Source: Regional Transportation Investments a Vision for Metro Vancouver. Select map to enlarge. The region’s mayors and the province locked horns over how Metro Vancouver was going to pay for its local share of transit costs. The region’s mayors wanted carbon tax and mobility pricing, the province was only interested in increasing property tax. 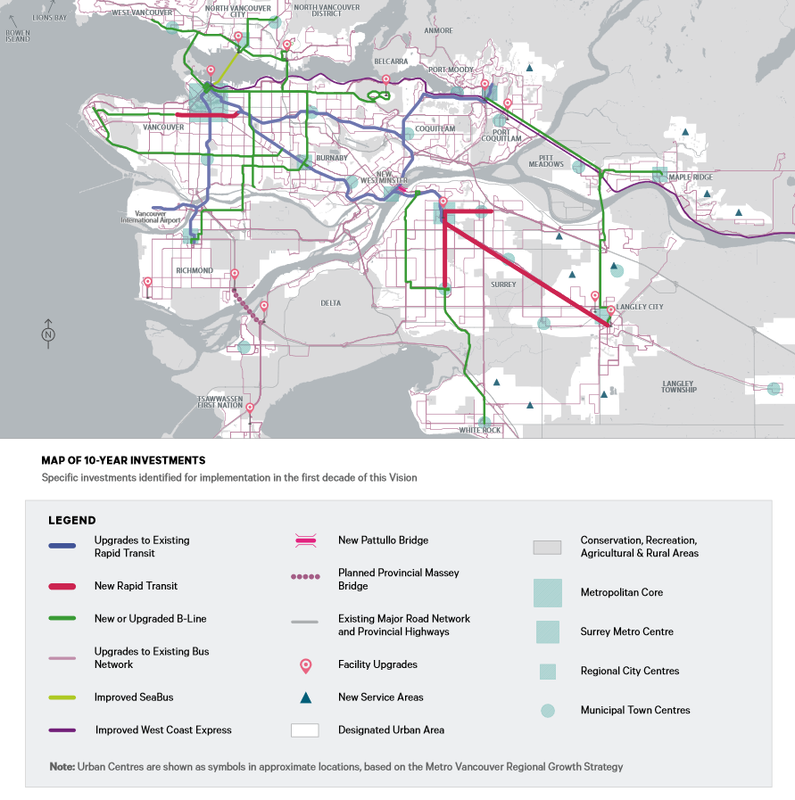 With the change in federal government, was a change in how transit projects would be funding. In the 2016-17 budget, the federal government committed to funding up to 50% of transit project costs, and make predictable funding available. There was the potential for both the federal and provincial governments to cover 83% of the project costs for transit expansion. The funding got all parties to the table which is why TransLink is now able to start the process of expanding transit service in the region. The mayors agreed to increasing property tax above the normal 3% per year, and the province agreed to look at a Regional Development Cost Charge for Transit. There was still a big question about whether the federal government would continue to provide predicable, long-term funding for public transit projects. There was also still a $50 million per year hole in transit funding which would grow to $100 million per year in 2022. The region still wanted the provincial government to approved a new regionally-sourced, provincially controlled funding source, plus commit to introducing mobility pricing by 2021. What this means is that the federal and provincial governments have now committed to covering 80% of transit project costs. This leaves a larger gap for funding the full regional transportation plan than was thought last summer, but that gap is much smaller than it was in 2015. So, what are the steps forward? Well, I think that the provincial government is still committed to a Regional Development Cost Charge for Transit. I believe that long-term mobility pricing will happen. The challenge is plugging that $50 million plus hole with a new regionally-sourced, provincially controlled funding source. I don’t see that in the cards currently. In order to move things forwards, our region’s mayors may need to look at increasing property tax once more for transit to plug that hole. It would work out to about $8 more per year for the average house in our region. $8 more per year for rail rapid transit throughout the South of Fraser, including to Langley, seems worth it. We are closer than ever to having a fully-funded regional transportation plan. Over the next year, I hope that the provincial government and region’s mayors will be able to figure out how to close the current funding gap.